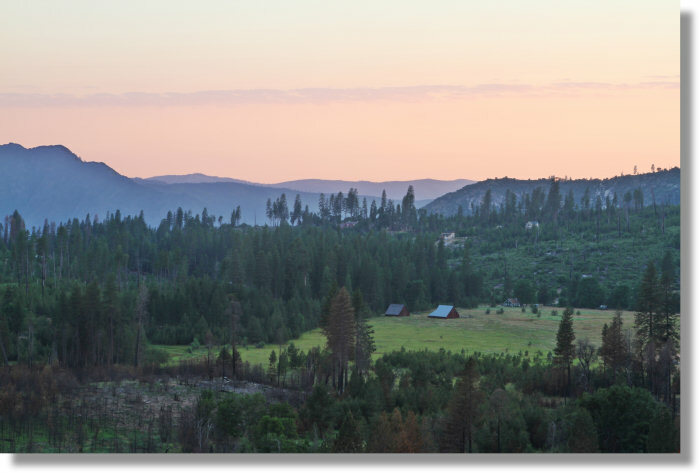 Foresta is one of three enclaves of private property within Yosemite (two more exist at Wawona and Aspen Valley). Private ownership of the area, originally intended as a grand summer resort, predates Yosemite's establishment as a national park, and the area remains privately held. It's a handy location for a Yosemite vacation headquarters, lying off the Big Oak Flat Road about six miles (10 km) from the western end of Yosemite Valley. There are no hotels or commercial properties of any sort in Foresta, but many of the cabins here are available for vacation rentals. 4yosemite.com handles reservations for several of them, and a handful of others are rented independently by their owners; see the full list below. The above photo, facing southwest, shows Big Meadow and the two venerable barns that spend their days in it. The homes of Foresta are scattered through the woods south and east of the meadow. The Foresta area was hit hard by the 1990 A-Rock fire and was damaged again by the Big Meadow fire of 2009 (see this wider view of the area). Consequently, there's a chance your cabin will include views of burned trees; make inquiries beforehand if this sort of thing puts you off. On the other hand, several cabins have views of El Capitan or Half Dome as well, a perk not commonly found among hotels in Yosemite - or anyplace else, come to think of it. Foresta lies at an elevation of 4,400 feet (1,340 meters), about 400 feet above Yosemite Valley. To reach Foresta from the valley, take the Big Oak Flat Road, which leads north up to Crane Flat and the Tioga Road. After 3.4 miles (5.5 km), you'll see a sign for the Foresta turnoff. Follow this road for just under 2 miles (3 km) to reach Foresta, located at the blue balloon on the map below.